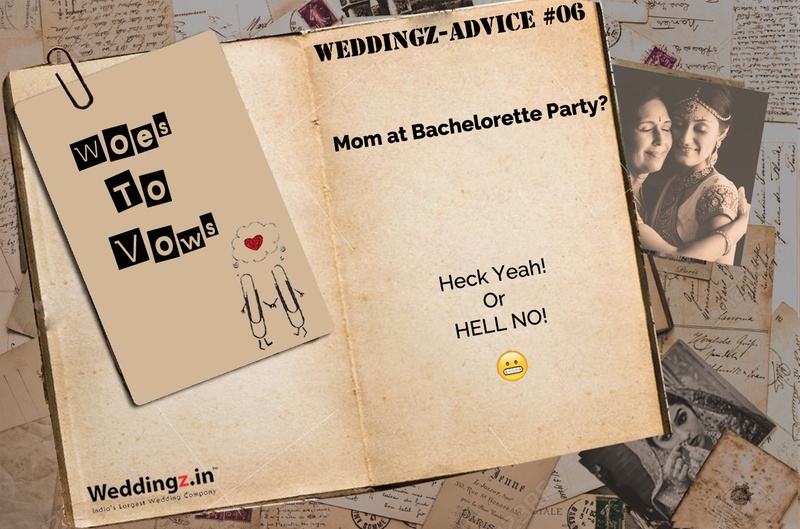 A bachelorette party is a place for friends and frenemies, sisters and cousins, not your mother! A recent trend however does not agree. With cool moms now on Facebook, loving Instagram and wearing trendy clothes that you sometimes itch to borrow - times have changed and how! If you share a close-knit relation with your mom, where you share almost everything with her, from your first time crush to your first kiss, then including your mom in your bachelorette party is a nice way to let her know that she is still young at heart and deserves that age barrier break. But if your mom is a lot more on the traditional side, it is okay to not invite her to your bachelorette party and have those boundaries. So, which side are you on? Would you or would you not invite your mom to your bachelorette party? Get to know what is her expectation from the bachelorette party, does she want to join you with your gal pals woohoo-ing at all those naughty chic-flicks you intend to watch at your sleepover or have a more low-key celebration, like dinner or spa day? This will pretty much give you an idea of how to go about with your party arrangements keeping her involved. We all know how much damage too much of alcohol can do to one. To avoid yourself, as well your mom from embarrassment, have a no-alcohol show. As much as this might sound boring, you can make it fun for all by engaging in activities that can get all excited. For instance, go on a fun road trip, a visit to an amusement park, learn to cook something new together or better yet go scavenger hunting. Moms quite understand, so it’s best to communicate and let her know all the possible reasons why she does not make it to the list. Avoid giving vague responses like ‘We’ll see’ and ‘I’ll let you know’ until the tenth moment to evade disappointments. If she still insists on attending, talk it out with her or have Plan B ready. Well this is the Plan B! You can divide your day into 2 parts, wherein the first-half you, your mom, to be mom-in-law, any and everyone who you want to include like your underage cousins or aunts can get along to do things that are fun and family friendly. For example, just roam around the city exploring new places or go for a cooking workshop, quite luncheon or spa treatments. This should keep them happy and at bay in the second-half of the day when you’re going all wild and free with your girls enjoying the last few days of singlehood. Moms are emotional, we know and that’s why we oh-so love and adore them. At this phase of your life she is on a high-peak of emotions just like you. The reason she so readily agreed to be a part of your bachelorette party without even considering your approval is maybe she already misses you and wants to spend some time. Though you can’t pay back for all the great things in life she has done for you, take time off for an exclusive mother-daughter date to be only with her making her feel like the most important person in your life.